Dendrobium speciosum variety curvicaule is found from just around the small town of Clairview, midway between Rockhampton and Mackay, then northwards to about Mt Dryander between Proserpine and Airlie Beach. From east to west it stretches from the coast to the Eungella Plateau. This covers some 200kms by 70kms. 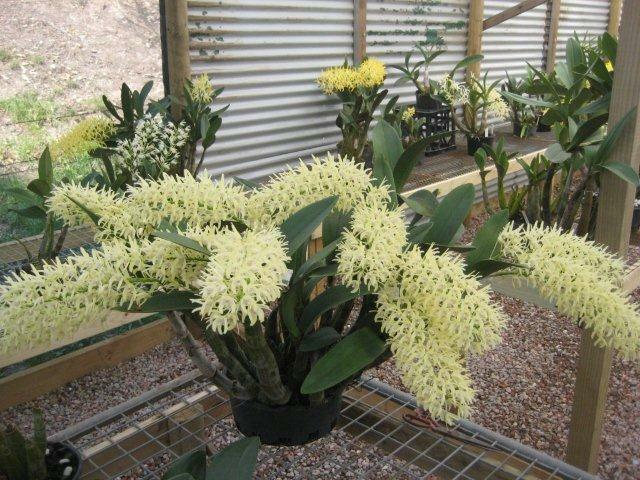 Its range is rather confined when compared to most of the other varieties of D. speciosum. To the west, south and the north of its distribution, it is flanked by areas of dryness and inhospitable country in which no types of D. speciosum are found. This has prevented var. curvicaule from crossing over with other varieties. Within its range however, it is an abundant orchid. Var. curvicaule occurs from virtually sea level, just north of Mackay, up to at least 1000m in the Clark Range, better known as Eungella, some 80kms inland from Mackay. It colonises both rock face and trees but is more predominant on trees, simply because its range contains some of the most extensive regions of suitable rainforest in Australia. Another region that I haven’t been into is known as the Cathu strip of mountainous country north of Mackay. Reports suggest that there must be an incredible quantity of var. curvicaule in those hills but access is restricted. As I write these words in the first week of 2013, I recall that it was only a few weeks ago that a visitor to my bush house asked me if it were possible to pick var. curvicaule just on vegetative appearance alone. So, having been challenged by this insolent trespasser, I had to quickly establish my superior intelligence and give a quick answer to the blighter. Actually, it wasn’t so hard to do once I took a bit of time to think it out. Firstly, the pseudobulbs can be enormous in both length and thickness, up to 850mm long to the first leaf and just as thick as your wrist. They are also ellipsoid in cross section. That means they are egg-shaped if you cut a cane in half. The most obvious difference that var. curvicaule has to do with the number of leaves on board. A really pumped up cane may in fact be graced with as little as two leaves, very often three but only rarely will it have four. Almost never will you see a five leafed pseudobulb. Three is virtually the number you’ll get if you take the time to count them. These leaves are very thick and leathery and don’t like to be bent too much or they may snap. After years in a bush house situation they become far more flexible but still have mostly three leaves. How many of you will sneak out to the bush house and start counting I wonder? That’s ok, send me your conclusions. Another aspect of the leaves on wild plants is the abundance of lichen and mossy type growth that occurs on the leaf surface. It does carry over to the bush house and may linger forever. This growth is often circular in shape and new chum growers will sometimes cry about it until they are assured it’s just what var. curvicaule does and that fear is not necessary . . . it’s not a viral plague! It is worth pointing out at this juncture that var. curvicaule does not have aerial roots. It will occasionally chuck out a root into the air, just like other varieties do, but it is not by any means the norm to have aerial roots per say. Remember, there are only two varieties of D. speciosum that do have aerial roots. These are of course var. hillii and var. grandiflorum. Oh, and I nearly forgot: the epithet “curvicaule” refers to the original description given to some plant or other that was supposed to come from a coral atoll called Lady Elliot Island where no D. speciosum has ever been known to occur. That specimen, wherever it really did come from, was curved in pseudobulb shape because it grew out from under a big rock or such. Any D. speciosum will do this in the wild so take no notice of “curvicaule”. They are nearly always straight . . . Variety curvicaule is very easy to pick by the shape of the flower and the habit of raceme. Flowers a best described as “chunky”. They are not thin on. They have a stumpy and broad labellum which is easy to spot once you have a bit of experience with all the attributes of the other varieties. No others are even close to the shape of the var. curvicaule labellum. Habit of raceme is also quite different to all the other varieties. In the general sense, the racemes are probably best described as “foxtails”. This means that the blooms are generally arranged in a tight kind of a bunch, and mostly lined up in beautiful rows like little soldiers staring out at you, to get poetic about it. Size of the blooms is usually around 35 to 50 mms; not large by speciosum standards but the general chunky appearance gives them a very solid look. Colour is most likely to be a light cream but everything from just off pure white through to light yellow will be seen. Occasional forms can be a mid-yellow but I have yet to see what you would call deep yellow or gold. Some forms carry the cultivar name of “apricot” but I think this is the product of a vivid imagination or a one out strange colour that doesn’t reproduce every year. I’ve stared into some blooms of this description but just can’t see it myself. Variety curvicaule is the major player in what are termed as man-made intervarietal plants. The aspects that it brings into speciosum breeding include shape and habit of raceme in the main. As I have stated elsewhere on this website, I think it has been used to death and become boring to some degree. The straight breeding of superior forms is where I see the future with var. curvicaule. Once a few good forms start turning up from this pursuit then they can be dabbled with further in the inter-varietal forum. Having said this, I have created a few inter-varietals myself, but using different clones from the well-known awarded ones. I see the need for a much broader range of breeding stock. This is especially so when it comes to colour. It can be extremely frustrating to locate regions that have a large range of specimens growing on rock. Occasional clumps will turn up in many areas, either on the odd large rock in a creek bed or smallish cliffs. Also, it is common to see plants growing low down on the butts of large palm trees. But if you are like me and want to see hundreds of different plants flowering at close range you just have to have access to rock face. There is no use in standing under a giant tree full of plants and wishing the clumps will drop off. Way back in ‘olden days’ there was a nursery at the top of the range in the township of Eungella. This was in the early 1990s. At that time, rainforest logging was still in full swing. The nursery literally had truckloads of native orchids lying around in heaps and many a grower purchased very cheap clumps of var. curvicaule. I was one of them. A friend and I had flown up from Sydney and hired a car for a few days. I purchased a few bulbs from 26 different clumps, threw most of my clothes away from the suitcase back in the motel in Mackay, and then stuffed the curvicaules into it for the flight home. I was as happy as pig in mud as they say. As the years went by and the bits grew up and flowered, at least one quarter of them were deemed to be superb forms of var. curvicaule. At least three of them I rate as equal to any var. curvicaule I have ever seen. My point is simply this. There are a lot of superior forms across the whole distribution of var. cuvicaule. If I can do what I did at that nursery, so easily, and end up with a about 20% of them being superior forms, then it screams out that the average var. curvicaule plant is pretty damned good. The simple fact seems to be that we don’t see a broad range of ‘average’ forms. We go to shows and see only the cream of the crop. A lot of today’s awarded plants of var. curvicaule came from that exact same nursery. They were mostly a product of random selection which ended up good because the average plant is far better than what we have believed they were. Very few, if any at all, of the famous forms of var. curvicaule plants were ever selected from seeing them in flower and merely taking a few bulbs of the best one seen on a particular day. Why? Because it’s not possible to see them up in the tops of trees! They are random plants picked up off the ground. Or from that nursery which had the licence to salvage victims of the logging operations. In the wash up it makes no difference where they came from, var. curvicaule is always a joy to behold.